Rovio has followed up their successful Angry Birds: Halloween app with Angry Birds Seasons. "Seasons" is a separate game for iPhone and iPad that includes the Halloween levels, and a new set of Christmas themed levels. The twist for the Christmas themed levels is that you play one a day until December 25th. That is kind of annoying while we're waiting for Christmas to get here, but the Seasons levels are harder for me to get 2 or three stars so I'll end up spending a day trying to get to three starts so it won't be a big problem for me anyway. One thing that I really like about Angry Birds: Seasons is that is supports iOS 4's Game Center feature so I can compare how I'm fairing against my friends and family in the leaderboards. 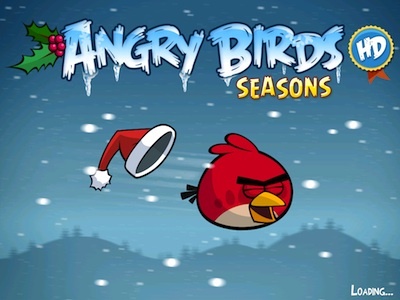 Like the original Angry Birds, Angry Birds: Seasons comes in two flavors: iPhone/iPod touch ($.99) and HD for iPad ($1.99). If you purchased Angry Birds: Halloween, Angry Birds: Seasons will be a free upgrade.